Hi friends, If you want to increase Google AdSense revenue. You should read deeply these 7 ways to increase AdSense revenue. This post contains the latest features as described in the end-year webinar of AdSense. Such as AMP, Ads Optim. Hi friends, I'm Gyan Ranjan. In this blog post, you will get the latest ways to increase AdSense revenue. Read deeply. Understand and follow the steps. You will get an amazing result. New AdSense upcoming features are awesome to increase Google AdSense revenue. This is the best way to increase your Google AdSense revenue as described by AdSense experts in the end-year webinar on 13 Nov 2018. You can decrease the bounce rate using the feature. The traffic will increase because of decreasing page load time. You can get high CPC because of lots of advertisers and companies love this AMP feature. In this feature, a page opens smoothly and fastly. That's the cause by which you get the best users response. So try AMP in some good response pages and look at the results in a weak. It must increase organic traffic to your site as well as revenue. This is the new upcoming feature of Google AdSense. In this feature, you don't have to change ad code and placement for better response. Google will do everything for you to increase revenue. Google AdSense team has shown it's a benefit in the webinar. It will be available soon. Use ad-responsive them to your site. You should place your ads in a good manner. 50 percent of your total ads on a page should visible in the first look. So change the placement of the ads just now. You will get a better result. 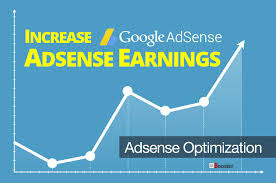 Your Google AdSense earning will increase by using this trick. Your content readability must be high. It should be more than 50 percent. For it write content with the best user-friendly. Use short sentences and paragraph for better readability. Content must be attractive, useful and SEO friendly. It will attract and stay the users on your site. As a result, traffic and revenue will increase. Use appropriate and long-tail keywords for your content. Distribute the keywords in a post in a good manner. Write your post targeting high CPC countries like the US, Kanada, etc. You can use a unique and appropriate sentence or phrase as a keyword. There are so many free and paid tools on the internet. You can get unique long-tail and high CPC keywords from where. Make sure your post is SEO friendly, before publishing. These kinds of posts rank fast. So you can get a high response, more traffic. In this way, your Google AdSense revenue increases. Link-Building is most necessary to increase traffic and revenue. So increase the no. of high DA backlinks on your site. The traffic and revenue increases as the high DA backlinks will increase. You can do it by sign-ups on Socia Media sites like Facebook, Twitter, Google+, LinkedIn, Reddit, Tumbler, Youtube, etc. You can buy high DA, PA do-follow backlinks from fiverr.com. Also, you can get free do follow backlinks from high DA sites by commenting. You can increase organic traffic to your site by following the above-described steps. Submit your site and posts on as many as good, reliable search engines and web directories as you can. You can take help of Adword or G Ads to increase traffic and revenue. The traffic exchange sites is also an option to increase traffic and new visitors to your site. But it may increase the bounce rate. So use it carefully. Its paid version may decrease bounce rate and increase traffic. These are the 7 best ways to increase AdSense revenue of your site. Thanks for this useful, helpful, informative and excellent post. Anyone can increase their Adsense revenue by following these simple and working tips.